Lewis Ferebee was not an obvious choice to lead Indianapolis Public Schools when the district was looking for a chief to bridge the rigid divide between traditional district and charter schools. He might have even been quite the opposite of what they were looking for: Ferebee’s background is steeped in traditional public school districts, as he served as chief of staff for the superintendent of Durham Public Schools in North Carolina immediately prior to his arrival in Indianapolis. For his doctoral thesis, Ferebee even concluded that school choice — as a means of school improvement under No Child Left Behind — had little impact on student learning. 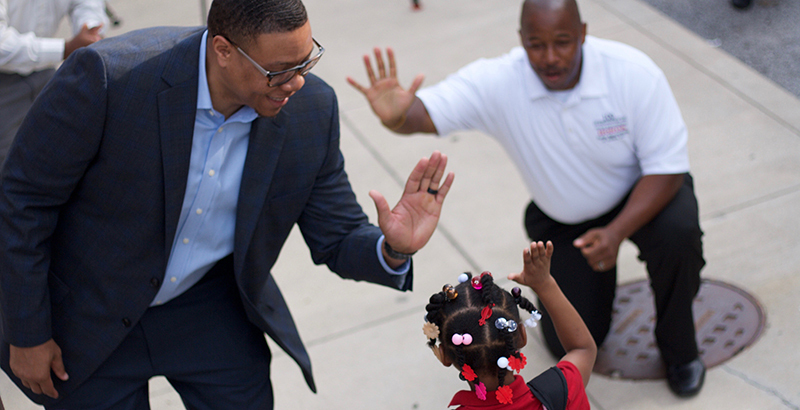 But since he stepped into the role of superintendent in 2013, Ferebee has developed stronger relationships between traditional district and charter schools, grown the city’s network of innovation schools, and worked toward giving principals more decision-making power. Ferebee: Our biggest accomplishment has been the expansion of high-quality options for families, aggressively intervening in our lowest-performing schools, replicating our highest-performing programs, introducing new and innovative learning models, and launching universal high school enrollment based on our students’ college and career interests and local workforce needs with all-choice transportation. At times, the challenge with aggressive interventions has been helping families understand the far-reaching disadvantages of chronically low-performing schools. Oftentimes, families are wedded to a school facility or a team of staff members and not necessarily the outcomes. Frequent and transparent engagement around student performance is critical to elevating family advocacy when we’re not serving students well. Choice has to be “true choice.” This comes with transportation at no cost to families. The expense and logistics of expanding choice with transportation can be quite challenging. Unfortunately, there are still doubters of the impact of high-quality preschool options. This is so important because, as we have increased the number of preschool offerings in our district, we continue to see that those students are more advanced in the acquisition of early language skills than students who have not had these opportunities. Sometimes I worry that we’re not moving fast enough to intervene in our lowest-performing schools. I think we have room for improvement in measuring the return on investment in our choice programs to better determine whether we are offering the right options and whether families are truly getting what they need. While our choice programs are in many cases our most diverse schools, we still cannot celebrate the level of diversity I would like to see in all schools. There are still zip codes where we don’t see as much activity with choice applications as we should, whereas other communities continue to have overrepresentation. As superintendent, I am responsible for guiding policy review and development to expand equity and access and funding, and to champion diversity within our choice programs and in all of our schools. While academic outcomes are paramount, I firmly believe that all of our schools must also ensure that our students’ social-emotional and physical development needs are being adequately met. I have seen the power and potential of communities owning the instructional model for their school. In the past, most of the choice programs have been brought to the community; however, I’ve seen how impactful it has been when families select the options that best meet their needs and interests. This level of collaboration is a driver for increased parent and student engagement. A vastly different labor market has caused us to rethink the high school experience for our students to ensure their continued success after they leave us. Our work in high schools is one of our strategic priorities, and this level of intentionality is driving large gains in student outcomes. We’ve seen a direct correlation between our career and technical education expansion and our increased graduation rate. I encourage more districts to contemplate how expanding career and technical education options can bolster student engagement and ultimately achieve what we consider the “3 Es” — ensuring that upon graduation every student is enrolled in college, enlisted in the military, or employed at a livable wage.